Rolls-Royce have translated their renowned automotive luxury 'land-yachts' to now grace the water too. The 62 meter Rolls-Royce crystal blue superyacht showcases advanced ship intelligence solutions, hybrid propulsion and grandeur of design. 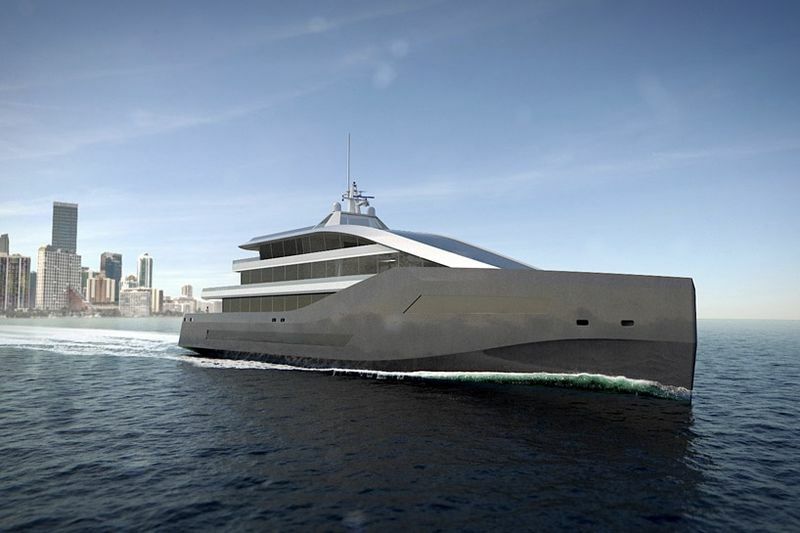 The vessel proposes a new, optimized superstructure that reconfigures the standard yacht layout to allow better guest use, including comfort for 12+ passengers and 12 crew members. A smaller 42 meter, remotely controlled convoy blue shadow is included, which transports and launches the mother ship's tender, helicopter and other water toys. Oskar Levander, Rolls-Royce SVP concepts and innovation, said: "Crystal blue has been designed specifically to show how new technology can meet the yacht sector’s increased demand for higher performance, greater operating ranges and increased levels of guest comfort, without impacting the environment." The system positions the bridge below the deck in order to free the more desirable spaces of the superyacht for the guests. "our ship intelligence and remote-control concepts have allowed us to design a yacht for the future that has the bridge located below the bow, inside the vessel" explained, Levander. "the crew is able to monitor and control the vessel using sophisticated sensors, cameras, display screens and situational awareness technologies; but an internal bridge frees up the traditional area of the bridge in the forward part of the superstructure to let owners and guests enjoy a panoramic vista that is traditionally only enjoyed by the crew." Additionally, it features a safe room where guests and crew members can seek refuge in the event of an unauthorized boarding. From there, they can override the controls and operate the yacht remotely or direct a shore-based centre to do so instead. The Rolls-Royce crystal blue superyacht enhances hybrid propulsion, while an intelligent, dynamic positioning system automatically controls twin Azimuth and a TT1100 bow thruster. This allows the boat to remain in the right spot on the water without an anchor, and follow the sun for an optimum tanning angle for those guests in the infinity pool or beach area. Combining an LNG fuel generator and battery bank, the vessel provides 1MWh of genset-free power during port stays and offers a maximum power of 20 knots. "We have a huge offering within Rolls-Royce and our portfolio is highly compatible with the marine leisure market. With crystal blue, we can show what can be achieved and how the yacht of the future might look. We can give complete freedom to yacht designers and, in so doing, better fulfil the yacht owners’ dreams" continued Levander. Take a look at the video below to see the yacht of the future. Bugatti Niniette 66 ' A Sport Yacht! Video: If You Are Part Of The One Percent That Is Stinking Rich, Then This 66-foot Bugatti-inspired Super-yacht Is Just For You.